Be seen as the right choice. Your firm’s brand encompasses its value proposition – the promises made to clients regarding the services to be provided and the needs to be fulfilled. An effective law firm brand distinguishes a firm from its competitors and creates the perception in current and prospective clients that the firm is the clear choice for their legal needs. 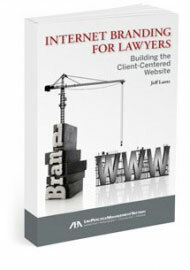 Effective branding separates a law firm from its competitors in the minds of the public and potential clients. More Business. Use branding to explain why your firm is right for client needs so that they have a solid reason for choosing your firm. Less Competition Around Legal Fees. Clients are willing to pay more for your firm’s services if you are perceived to be the leaders and best attorneys for their needs. Increased Client Loyalty. By reinforcing that a firm is the leading legal counsel for legal needs, clients will be less inclined to want to use other attorneys for their matters. While each law firm is unique, the default perception in the public is that law firms offering similar legal services are indistinguishable. How can a person needing representation for a personal injury choose one firm over another when each firm promises to “deliver justice,” and when all law firm websites and their logos all look the same? While lawyers in the legal community may understand exactly how one firm differs from another, the public does not have this same information. If a firm does not differentiate itself from competitors, it will be, by default, perceived exactly the same as all other firms offering the same services. We develop law firm brands that resonate with clients and drive new client generation. 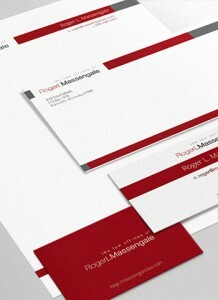 Our law firm branding positions firms as being the clear choice for their clients. Instead of focusing solely on the legal services provided, we focus on how the firm fulfills client needs. Fundamentally, clients don’t want to hire lawyers, they want to have a need fulfilled; hiring a lawyer is the necessary way to achieve their legal needs. We undertake interviews with firm attorneys to carefully understand not only the areas in which the firm practices, but also the unique attributes of the firm and its attorneys. We also want to understand that the clients that they firm seeks to attract, and how the firm may wish to evolve with respect to the practice areas and services that are offered. Once this information has been prepared, we create a Branding & Identity Memorandum, which sets forth our ideas on positioning the firm, and the key messages to be conveyed, in part,through the website and in the branding collateral. Upon approval we prepare multiple logo and collateral concepts, in addition to the website design and development (if we have been retained for these services). Once your brand is developed, business collateral is created, including a logo, business cards and stationery. The branding – consisting of messages, images, and other aspects – is then conveyed into your firm’s one source of continuous marketing – its website. The website must clearly convey the brand to prospective clients. The website must be centered around CLIENTS, not your firm. Your website should address the primary question that all clients have – what are you going to do for me? We can work with your law firm and provide the insight required to create an effective brand for your firm. Call us today to learn more and get started!